Squirrels are playful little creatures that are a lot of fun to observe. If you’d like to encourage their visits, consider getting a squirrel feeder and installing it on the edge of your property. This is a great idea, even if squirrels are targeting the crops in your garden. By giving them something to eat, they will most probably leave your plants alone. 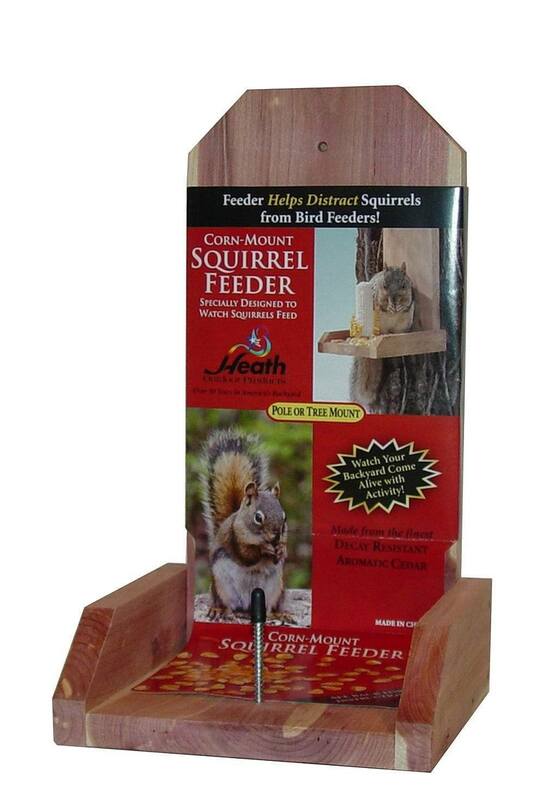 Various companies have created feeders that are ideal for having a little squirrel corner in your backyard. The selection of one variety or another will depend entirely on your preferences and the budget that you can dedicate to the purchase. As the name indicates, this is an environment-friendly product. Woodlink Going Green Squirrel Munch Box happens to be one of the most popular items among squirrel lovers. 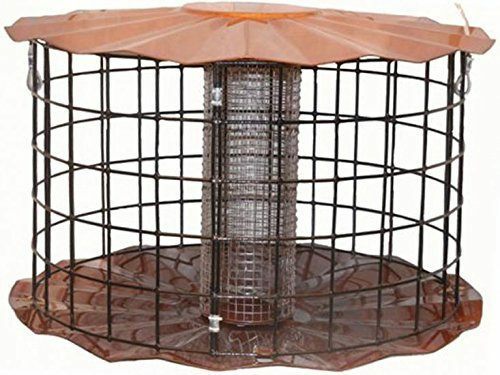 The feeder is made from recycled plastic. There’s a clear plexiglass wall that shows how much food is left inside. A wooden ledge on the side of the feeder allows the squirrel to stand on it and enjoy a delicious meal. The feeder can hold up to 17 pounds of mixed seeds. There’s a nail on the ledge that allows for the placement of one ear of corn. In terms of attachment, the back panel can easily be fastened to the trunk of a tree. All of the nails and the necessary attachment components are included in the kit. Because it’s made of relatively thick plastic, the feeder is durable and it will remain in a good condition for years to come. Squirrels can easily reach the food and larger birds will be incapable of getting to the grains. On the downside, some buyers report that squirrels like to chew on the plastic – a fact that can potentially lead to the destruction of the feeder. 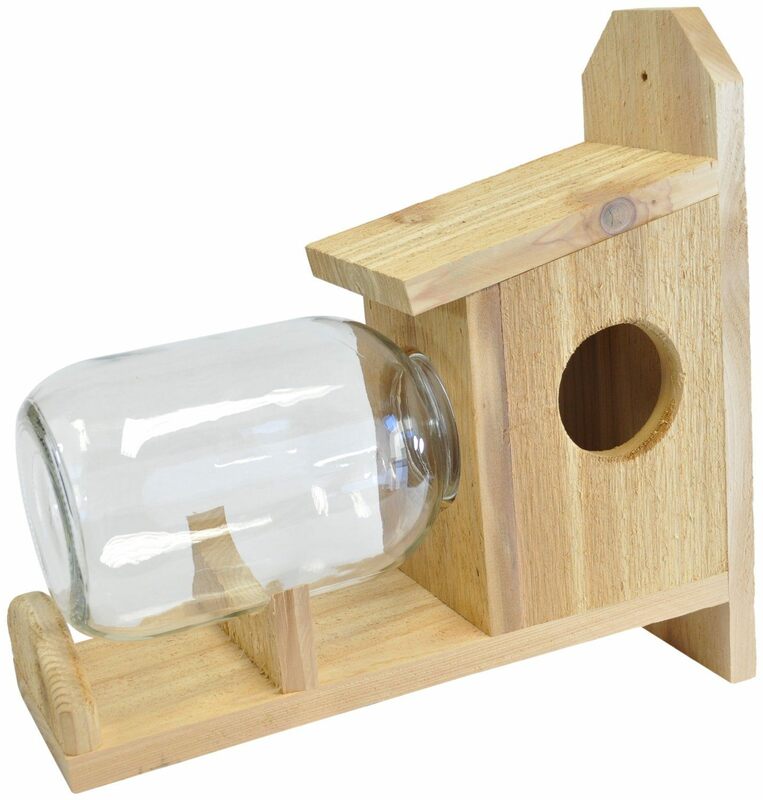 Made from cedar wood, this feeder is beautiful to look at and it’s gotten an overwhelming number of positive customer reviews. Backyard Boys Woodworking BBW8 Squirrel Under Glass Feeder consists of a jar that can be filled with nuts or grains and a squirrel house construction. The volume of the jar is one gallon. The jar can be removed easily for refilling purposes and this also simplifies cleaning the feeder from the hulls that the squirrels will typically leave inside. The problem with the feeder is that it’s made of wood that can deteriorate with the passage of time. Due to heat and snow, wood will get dry and it may potentially become deformed. If you’re looking for something a bit more durable, it’s a good idea to stick to squirrel feeders that are made of plastic. Also, keep in mind that the feeder is a little bit small for bigger squirrel species. The opening of the box is 3.75 inches in diameter. If you’re looking for a product that’s going to be a good distraction from the bird feeder that’s positioned in your backyard, Heath Outdoor Products 903 Squirrel Feeder would be it. designed to hold a single ear of corn, this is a feeder that squirrels will definitely enjoy. The feeder is made from decay-resistant wood and it can easily be mounted on either a pole or a tree. There’s a ledge that the squirrel can sit on while it’s enjoying the delicious corn. There’s nothing fancy about the particular feeder and this is one of its features that most buyers enjoy immensely. It’s possible to get a couple of those and position them throughout the property. Once they get used to the feeders, the squirrels will be quite entertaining to watch. The final entry in the list is the Erva Bird Proof Squirrel Feeder. It’s cleverly constructed to keep birds away and allow only the smart squirrels to access the food. Erva squirrel feeder has the shape of a house and the roof is a lid that can be lifted. This is how squirrels get access to the food. The feeder is made of tough metal and it’s probably the most long-lived entry in the list. 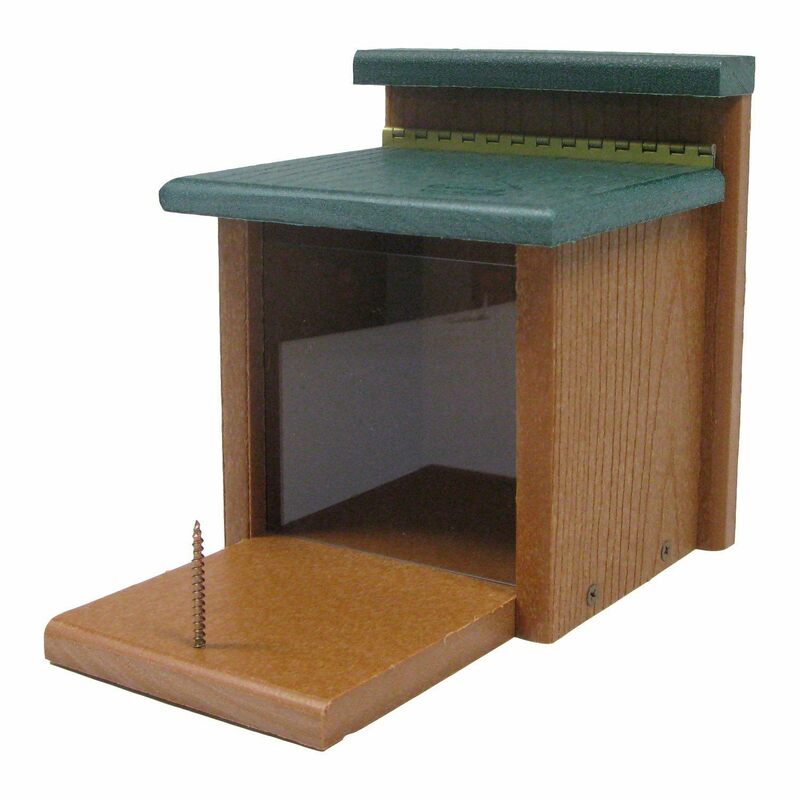 The feeder can hold about two pounds of mixed grains and it has a ledge where the squirrel can stand. It measures 12 by seven by seven inches. The only downside is that the product is a bit more expensive than the other feeders. Keeping in mind that it will remain in a good condition for a very long period of time, it may be a good idea to invest a bit more in the product.